It's been awhile since I've been able to get some quality time in my craft room. I sneak a bit in here and there. There is just so much to do in the summer. my garden is growing and life is good. My card today reflects a lazy summer day to me. The sentiment makes me smile as it is so true! three dimensional look. Two tiny red pearls add extra zip to the yellow pair. Some sponging and paper piercing finish my card up. and unique stamps to help you get your summer on. now would be a great time. Super fun, summer card! Love the definition of "care-free" tucked in on the side. Very creative! Makes me wish summer will never end. 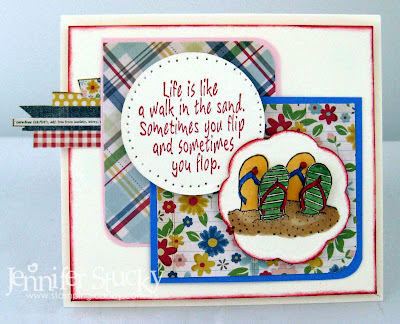 What a fabulous summery card Jenny! Very cute card! Love that fun sentiment and the flip flops are adorable. Loving the pop of red - feels like summertime! Great sentiment, too! Got a real chuckle out of this card! What a great pairing of sentiment and image!